You may have seen a meme featuring two men furiously arguing and wondered what on earth it was all about. 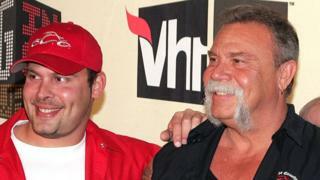 The five-panel series of images known as the American Chopper meme uses stills taken from the reality television show of the same name to show a father and son having a melodramatic argument. The programme began in 2003 and ended in 2010, yet online interest in it surged in March and April 2018. The images have been liked, shared, retweeted and upvoted hundreds of thousands, maybe millions, of times across multiple social media sites, and used to explain everything from US constitutional law to protection of the oceans. So, how did a simple series of images and text, originally posted to Reddit in 2011, become one of the most popular memes on Twitter in 2018? Expectations vs. Reality: Is this 1921 cartoon the first ever meme? The image seems to have first appeared in the popular Reddit community r/Funny in November 2011, where the captions subverted the anger of the two men by suggesting one was simply moving a chair for the other. It was subsequently reposted many times over the next few years with some slight variations. So, according to the definition above - when different jokes with the same series of pictures began - it then became a meme. In March 2018, the image reappeared in various Reddit communities with new captions. It coincided with a new series of American Chopper airing on the Discovery Channel in the US. With people once again interested in the television show, the Reddit posts began to reappear on Twitter, inspiring further variations of the meme. Its popularity saw the meme covered by various news outlets online, such as Vox, Mashable and Vice. However, this may have led to the meme's demise within the r/MemeEconomy community on Reddit, where memes are tongue-in-cheek bought and sold as if they are shares on a stock exchange. There, a meme's value is seemingly tied into its potential for millions of people to understand and use its format. Ironically, the value of a meme also depends on it not yet gaining mainstream acceptance. On 29 March 2018, a post on r/MemeEconomy - titled 'Sell Sell Sell' - featured a tweet from digital media company Vice celebrating the Chopper meme. The post was upvoted 28,000 times along with comments saying the joke "had a good run," and "when it becomes Vice's favourite meme it becomes everyone else's least favourite". In the first week of April 2018, the meme took on a second life on Twitter, focusing the humour around the two men arguing about a random topic. Particularly, people exploited the panel structure to explain complex arguments in a concise form. Erica Goldberg, an assistant professor at the University of Dayton Law, created a version of the meme which explains arguments surrounding the US First Amendment. Matthew Yglesias, a journalist for Vox Media, used the meme "to illustrate the pedagogical power of socratic dialogue," and Monterey Bay Aquarium in California posted their variant to express arguments around ocean awareness. Bizarre uses of the meme emerged as the subject of the joke changed with every tweet. One version saw the meme drawn in the style of the music video to Aha's 1980s hit Take On Me, while Twitter user jimoutofbennies turned it into a joke about the shape of the meme itself. These variations began to reappear on Reddit, with a repost of jimoutofbennies' six-panel version becoming the most upvoted post to date on the r/memes subreddit. Following this spike, the meme's use has declined dramatically, and its final hurrah seems to have come courtesy of one person on Twitter, who used five tweets from Donald Trump to contrast the US president's previously-held beliefs about Syria with his current actions in the region.